The Intro Course is geared to students both new to yoga, or new to the techniques of Iyengar Yoga. Standing, seated, inverted, and restorative poses are introduced. Mastery of Intro poses leads to a deeper, safer, and more fulfilling practice. They are the basis for the more advanced asanas. Most students attend this class for 6 – 12 months before advancing to Asana I. The Intro Course draws on the practice syllabus for beginners described in Geeta S. Iyengar’s Yoga in Action: Preliminary Course and Yoga: A Gem for Women. Students benefit most in their practice by regular class attendance. The Yoga St. Louis 5-day Intro Intensive Course culminates the necessary preparation to step up to the Asana I class. Asana I class extends the Introductory Course and refines the poses already introduced. Students are introduced to the Sun Salutation sequence (Surya Namaskar) and work on perfecting inversions (Shoulderstand and Headstand). Modified poses that benefit recovery from illness, menstruation, and pregnancy are also presented. 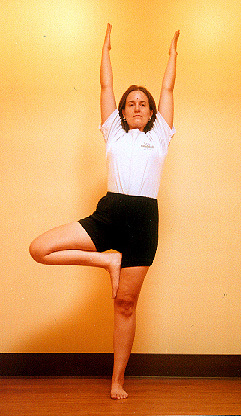 Kathy Digby in Baddha Konasana before giving birth. Photo: Bruce M. Roger, 2008. Pranayama (breath work) and restorative poses are covered every fourth week. Advanced postures (e.g. backbends and arm balances) from the Asana II (third year) practice syllabus may be covered depending on student capabilities. 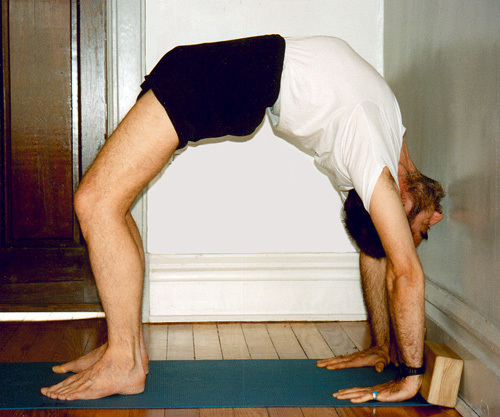 Backbends and arm balances are introduced; inversions and sitting poses are practiced regularly; pranayama and standing poses are further refined. Personal daily practice is based on the asanas and pranayamas presented in Yoga in Action: Preliminary Course. Admission by permission of the instructor. This class is for students who want to deepen their practice, or seek assistance to work with limitations that prevent participation in a regular class setting. A minimum enrollment of 4 classes is required for new students, scheduled and fully paid prior to the first class. For students who would like to broaden and deepen their practice in order to move up from Intro to Asana I. Offered semi-annually in July and December. For all Intro and Asana I students who would like to deepen their practice, such as by learning home practice sequences. Offered semi-annually in March and November.